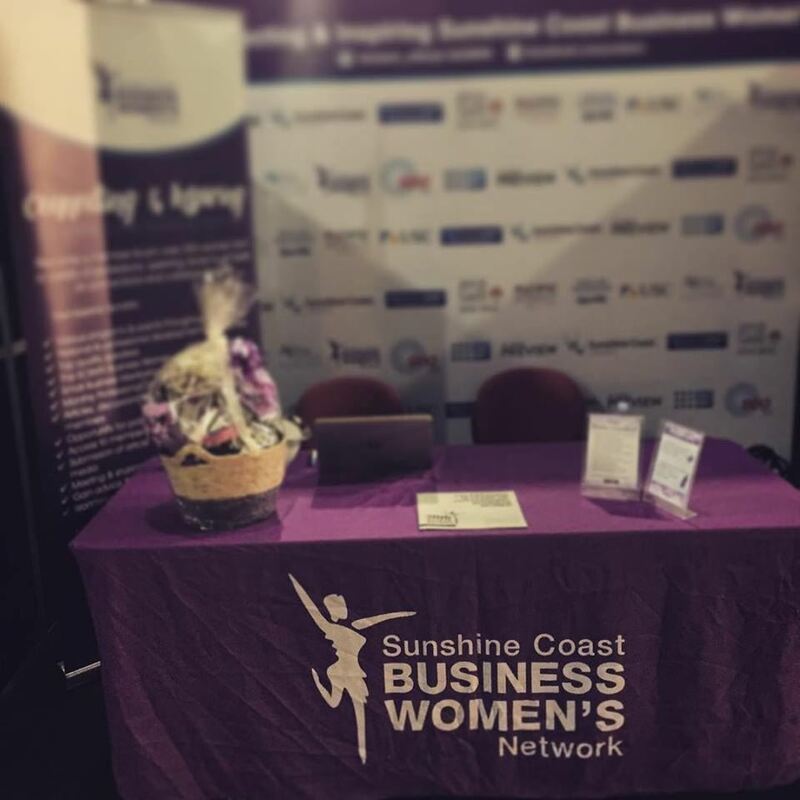 This weekend the SCBWN had a stall at the Sunshine Coast Women's Lifestyle Expo and we had the opportunity of talking with lots of beautiful women who are seeking connection and business opportunity in our region. 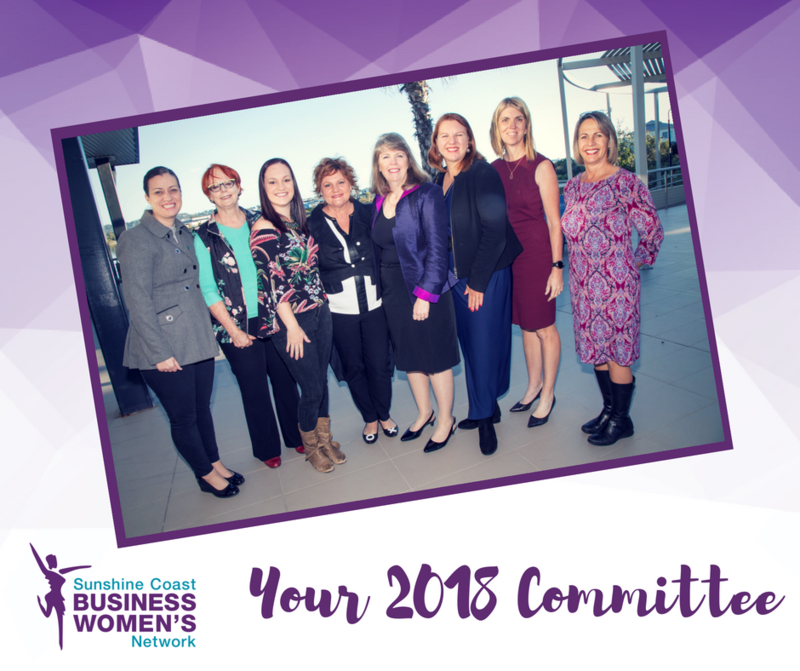 There continues to be an incredible number of passionate business women who have so much to share - this event has been inspiring! Nearly all these women in business face challenges and find connecting with other women to talk through their challenges and celebrate their wins helps them get through the hard times and really enjoy their successes. 99.9% of women were excited about our bottle of wine in our giveaway hamper! Who doesn't love a glass of wine and a good chat! Lots of new Sunshine Coast residents are looking to connect with our business community - let's welcome them with open arms! Some interstate and many international re-locators are loving our region. Health, wellbeing and personal growth are key topics of conversation and we LOVE the positivity that surrounds this. We've enjoyed talking with these wonderful women and hope to see many of them in our membership soon at joining in at our upcoming events! 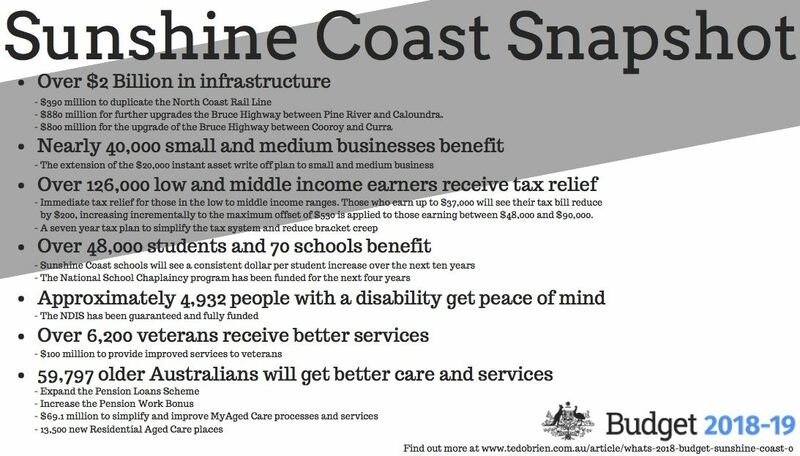 With the recent release of the 2018-19 Federal Budget we sought insight from Federal Member for Fairfax Ted O'Brien on what impacts we might feel as business owners and community members of the Sunshine Coast. The following snapshot has been provided to highlight the main changes. For more information on the Budget click here. 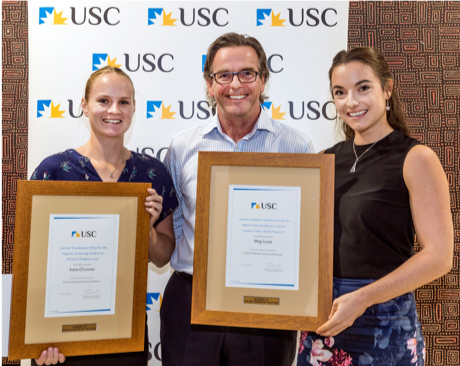 The University of the Sunshine Coast (USC) recently held its annual awards ceremony at the Innovation Centre, spotlighting the best and brightest students in the areas of Arts, Business and Law. In keeping with their deep and ongoing commitment to recognising and celebrating excellence in the community, Garland Waddington proudly sponsored awards for the highest achieving students in the subjects of Tax and Estate Planning and Property Law. Partner, Brendan Bathersby had the privilege to present the awards on the night to Meg Lucas and Katie O’Connor and congratulated all award recipients at this year’s Faculty of Arts, Awards Business and Law and Prizes Ceremony 2018. Garland Waddington enjoys playing an active role in our community whether through providing legal assistance or financial support to worthy causes or encouraging staff to be part of one of the many community projects and industry associations we support each year. "We are proud to add value to the broader community and to make a positive difference to the lives of others." While television shows like The Brady Bunch and Modern Family make entertaining viewing, the reality is that once-harmonious blended families can soon turn into warring parties if a parent or step parent forgets to update their will. Ken Waddington a Partner at Garland Waddington Solicitors, Maroochydore, reminds us that many Australians wills were often out of date and failed to reflect current family circumstances. Public Trustee data, cited in the “Having the Last Word” report1 by The University of Queensland, showed that complexity of the family relationship was a trigger in 62 percent of disputes over estates. New spouses or partners, separation or divorce and the addition of step families were all listed as factors likely to lead to a will challenge. Close to 6 percent of families in Australia include step children, and determining who gets what under a will is often based on the extent to which children are seen to be children of both parties. Factors such as the length and timing of the relationship, the age of the step children at the time, and the degree of active parenting all come into play when will-makers decide how to apportion their estate. “One of the major grey areas in the past has been whether a step child of a de facto relationship could make a claim against the estate of their step parent,” Mr Waddington said. Changes to the Queensland Succession Act, made in June this year, have now made it clear that the meaning of ‘step child’ includes the child of a party to a de facto relationship. Mr Waddington indicated that estate matters could become complicated if parties in a de facto relationship with step children or joint children had failed to revise their wills, dying with out of date wills listing ex-partners or biological children as sole beneficiaries. 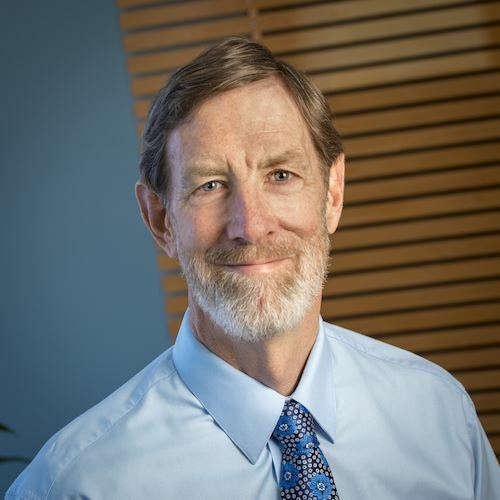 “Just another reason why it’s so important for people to update their wills to provide clear direction on how they want to provide for their partner, step children and biological children from current and past relationships,” he said. Does your website stack up ? Do you know the legal requirements and responsibilities of running an online business? Does your website comply with Australian legislation? Below are the three most important legal aspects that you should be aware of. Check to see how your website fares. Do you have a Contact Form on your website? Do you publish information or provide advice on your website? Do you sell goods and/or services on your website? Note: the above information is not intended to be, and should not be, interpreted as constituting legal advice. For more information on website compliance, click here. Thank you to Jane Cluff from Felicity Jane for this blog. My name is Dr. Grace Jones, I am a nationally registered acupuncturist and the owner and director of Acupuncture with Grace, an integrative acupuncture and Chinese medicine practice in Maroochydore and Buddina on the Sunshine Coast. I am incredibly passionate about helping people from all walks of life improve their health, through a combination of modern Western and traditional Eastern treatments tailored specifically to each individual patient. I am highly trained and passionate in the areas of women’s health, fertility & IVF support, pregnancy support, pain management, and stress/emotional support. My greatest love is in helping people to gain a sense of wellbeing they didn’t even realise was possible, and I look forward to helping as many people reach this as I can. FIRE UP Coaching® leads the field when it comes to Leadership Training, Accredited Coach Training and coaching individuals to reach their potential. As a Registered Training Organisation (22458) we offer unique training programs both accredited and non-accredited to develop the individual potential that often lies latent in organisations. We can deliver full qualifications or customised programs of any length. We work with you to design the solution that will best fit with your strategy and budget. Our flagship programs are our Diploma of Leadership Coaching and Mentoring (22233VIC) and Certificate IV in Business and Personal Coaching (10547NAT) both which align with the International Coach Federation (ICF) core competencies and are the most comprehensive and practical accredited coach training programs in Australia. FIREUP is also an ACTP (Accredited Coach Training Provider) with the International Coach Federation (ICF) training program. Both our programs are unique in that we utilise a coaching conversation model called REACH which was originally developed by FIRE UP Coaching for Queensland Health but is now integral to all our coaching programs. The REACH Model has been acclaimed by many of our clients as superior to any of the previous models they were using. It is sophisticated enough to allow conversations of depth in any context, and has particularly been embraced by our health, education and emergency services organisations. We also utilise the power of whole brain thinking, positive psychology, neuroscience and strength based approaches to inspire our students and take them to new expanded levels of awareness.